Antminer S1 is the 1st generation of Bitcoin mining hardware based on Bitmain Technologies chip marked as BM1380. 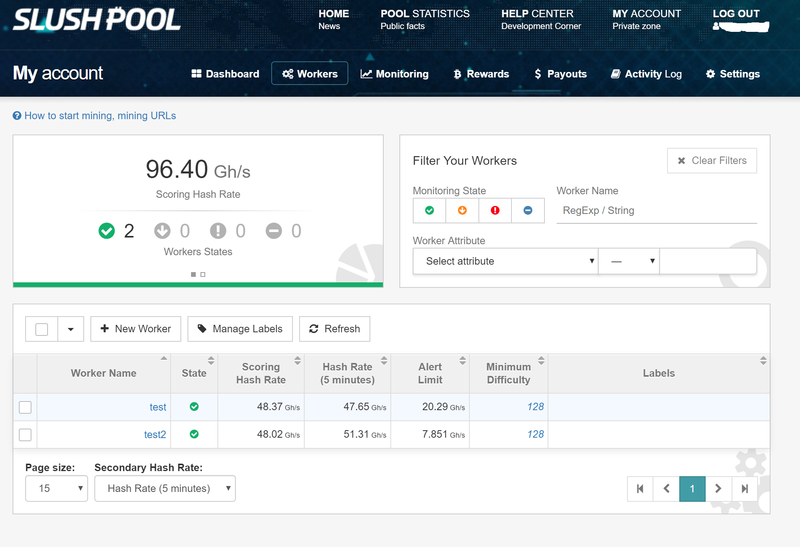 There are 64 chips (2 boards, 32 chips each) per miner offering hash rates at around 120GH/s under normal conditions. 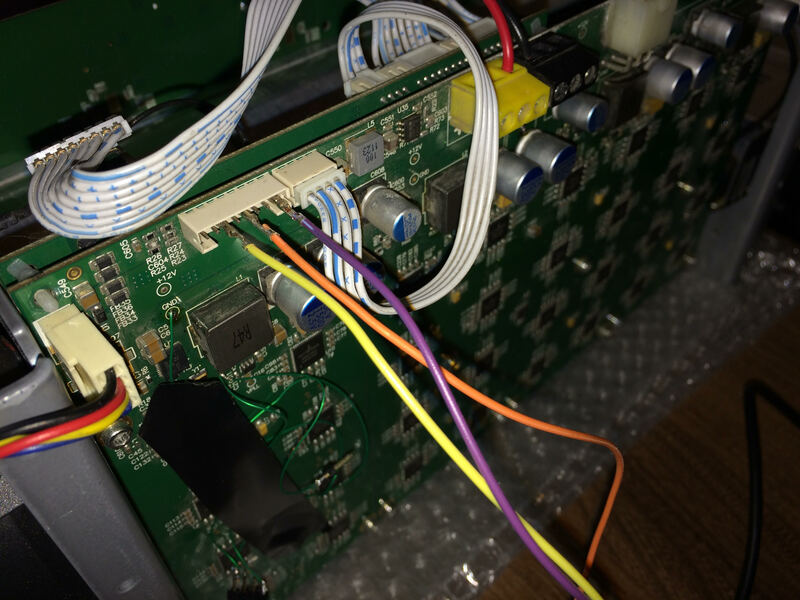 In this article I present my approach at reverse engineering the communication protocol the chips use in order to make them do some actual work (i.e. mine some Bitcoins). At the time of writing this post were clearly much more powerful mining rigs available making the S1 pretty much obsolete, which makes for a perfect opportunity to acquire the S1 for next to nothing. If you, Dear Reader, are feeling generous and might find my writing beneficial, then feel free to donate some BTCs: 152dEicovRXbxBgTmoY3izd7ThrxRNdPqW Much obliged! First of all: the datasheet gives very little information about how this chip actually works (I imagine that more detailed specification is available for those that buy these in large quantities). Schematics of S1 reveal information about the functionality of certain pins. All of the chips are basically sharing the same UART “bus”. Flow control/bus arbitration is done using BI (Busy Input)/BO (Busy Output) signals. Chip that wants to send the data out activates it’s Busy Output signal which mutes all chips that are placed further in chain. Chips have addresses derived from the state of address pins ADDR[7:0] which also determine the MSB value of starting ‘nonce’. S1 has these equally spaced like 0x00, 0x08, 0x10 … 0xf8, so that each chip covers different (and equal in size, 0x07FFFFFF) area of nocne value search. One can see that the pinout is really optimized for daisy chaining. Single hashing board of S1 uses only one crystal oscillator, all other chips derive their clocks from preceding chips in the chain. Even the Reset signal is chainable. Chip is ready for work just after powering up (no need for any form of initialization if you are happy with default clock frequency of 193MHz). Chain awaits for 64 bytes of work data after which it stars searching for a valid nonce. Chips report nonces that result in hashes with at least 32 leading zeros. There might be more than one such nonce in the whole 2^32 nonce search space, but there may be none as well. Chip report results in the form of 5 byte UART messages only if a valid result is found. No messages will be emitted if no valid nonces were found. Because of that it is essentinial (from the performance point of view) to know how much time it is needed for the chain to do the full nonce search and after that time has passed we need to switch to the new work as soon as possible. Sending work data interrupts current work and restarts the whole nonce search. No other signalling is needed in order to make the chips work on new data. Chips start to look for valid nonce beginning at starting nonce which is configured using address signals. Commands – 4 byte messages ended with CRC. Valid CRC is crucial – chips interprets data as commands only if CRC is ok.
Not every command/work vector will result in response. Every response is always 5 byte long which eases the processing. Command responses differ from Nonce Responses by the CRC5 (of course certain nonce values may produce Nonce Responses that pass the CRC5 check so it’s not the reliable way of determining whether the response is caused by command or Work Vectors). Command used to set the operating frequency. Has a direct impact on hashrate. Can drive the ICs into self-destruction if no proper heatsinking is in place. Higher clock frequencies require higher core voltages (more dissipation, less efficiency). Chips are happy with only 0.8V of core voltage for nominal operating frequency of 193MHz, pushing the clock any further results in much more errors (nonces that don’t produce hashes with at least 32 leading zeros) being reported, making the overclocking profitability (without rising the core voltage) questionable. Does not provide a way to address a single chip from the chain (not that useful when you think about it), so it only makes sense to use it with ALL bit set. I wasn’t able to get the full picture of certain parts of frequency coding words, still one can easily see that ‘bbbb’ bits make for the PLL’s VCO divider – increasing it’s value by two results in a clock faster by twice the REFFREQ (25MHz from crystal) Different coding for 193MHz must result in PLL using some prescaled version of 25MHz reference clock. Bits denoted as ‘dddd’ drive the output divider giving following ratios: 0x1 – /1, 0x2 – /2, 0x3- /4, 0x 7 -/8, 0xF -/16 – so you can go very slow (useful for developement). Here are a couple of “popular” frequency settings. It seems essential that Set Frequency command is followed by a Read Register with reg address of 0x04. Doing otherwise results in chip being unstable (Few chips in chain stopped reacting to commands). Deactivates chaining which results in only the first chip being operational. Did not find an easy way out from this state (except from reset/power-cycling). Might be useful for testing purposes. No addressing mechanism is found, so after issuing you are always left with the first chip in chain. Not very useful for normal operation. 64 bytes that provide data for the chain to work on. Chips start cranking nonces immediately after whole 64 bytes are sent. All previous computations will be discarded. No CRC is included. Midstate and Job Data fields are byte reversed (not bit-reversed). Work ID is used for pairing Nonce Responses with Work Vectors, you can choose any number that fits in this field, it will simply be copied to Nonce Response. Emitted every time a valid nonce is found. Probably easiest way to do it is to use a terminal and send out the Read Register command (0x84, 0x00, 0x00, 0x11 <- I took the liberty and precomputed the CRC). You can clearly see that all the chips from the chain have reported their addresses (4th byte of every 5 byte response). Since I’ve gathered all the information needed to put these chips to use I’ve developed a simple piece of software in node.js that communicates with the mining pool (using Stratum), gets the work, prepares the work vectors, receives nonce responses, checks them against current pool’s difficulty and submits all the nonces that pass the check. Github repo is available here. Both boards produced the same hash rate (no noticable difference over time). Pool I used was slushpool.